Being fully engaged in the moment seems increasingly hard for people to do these days. Our lives are not just filled with business but with "busyness." We spend much of the day "living in our cluttered heads" and fail to see, I mean really see. We miss so many moments each day, moments which may have been teeming with inspiration, stimulation, beauty, art, emotion, perhaps even answers to our questions if we had only noticed. But we were not aware, and we did not observe. In Buddhism Plain and Simple, Zen priest Steve Hagen reminds us that "We tune out much of the world — and much of ourselves as well. And we don't even realize how removed we are from what is going on." Hagen says that most of us fail to live life to its fullest because we freeze our lives into a certain view. When you think about it, the really great creatives — designers, musicians, even entrepreneurs, programmers, etc. — are the ones who see things differently and who have unique insights, perspectives and questions. (Answers are important, of course. But first comes questions.) This special insight and knowledge, as well as plain ol' gut feel and intuition, can only come about for many of us when slowing down, stopping and seeing the world for what it is in all it's complications, in all its simplicity, and in all its reality there before us. This may sound like new-age gobley gook, but it really is just a matter of slowing down. Yet, this is easier said than done. What got me thinking about this is a new website by a buddy of mine, Kyoto-based Swiss designer and artist Markuz Wernli Saitô. Markuz is in the middle of a very cool relational art (what's that?) project which is related to this idea of slowing down, taking time and "being in the moment" — and he's sharing it with the world. Go to the Momentarium website set up by Markuz for this project to read his idea behind the project. Says Markuz: "Each moment of the everyday, every action of living, poses the question: how it might be lived differently, more truthfully and respectfully." With this in mind Markuz offers up his services, one hour a day, every day, for about twelve weeks in various Kyoto locations. This is being done, says Markuz, "...in an effort to ignite our streamlined, hyper-functional lives with meaningful encounters and fresh discoveries...."
Each day of the week brings a new "creative treatment in urban environments" and you are all invited to join Markuz or watch the episodes unfold from where ever you are around the world in QuickTime. I love the simple way Markuz has presented his ideas on the website including the video recordings which have been edited (no audio needed) to give us the essence of the daily happening. I really like his simple use of graphics for the calendar. You may download the calendar in PDF as well. 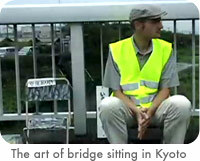 Bookmark this page to follow the daily video updates of the Kyoto encounters. Markuz's seven "meaningful encounters and fresh discoveries" in many ways are simple things we can remind ourselves to do ("practice") at least once every week. I rephrased them a bit to fit my own individual circumstance below. By remembering these (among others), I feel I can remain more aware, more connected, and perhaps more creative. • Take a break, enjoy a simple cup of tea in a different setting than ever before. • Express your gratitude to someone whose important contributions go unsung. • Take a walk off the beaten path. • As you walk in your city, ask yourself how the contributions of many might make a difference on a sterile infrastructure. • Gain an even greater appreciation of trees. These Oxygen producing, Carbon Dioxide absorbing trees are, as Markuz says, living chronists of urban development and human activity." • Take time to sit down outside and take in the scenery. No book. No laptop. Just sit and take it all in. • Tell your story. And listen to the stories of others. Last week at the Apple Store, another Kyoto-based artist, Karl Escritt from the UK, gave a wonderful and highly visual talk for the September Design Matters meeting. What I found interesting is that although much of the final output of Karl's work may be in, say, Adobe Illustrator, his process is very much organic in the sense that he uses a great deal of material from the "real world" — such as duct tape, clips from 1970s fashion catalogs, old photos, photocopies, yarn, etc. to create much of his work. Karl said that he usually starts projects with the Mac off. For him it is best to leave the computer off while trying to come up with ideas and forming concepts and treatments for communicating an idea. This was refreshing to hear, especially from a young designer/artist who grew up with technology. I also work this way and advise others to think about "going analog" in the initial stages of designing a visual story for example. "Going analog" is one way to sort of step off the grid and slow down. With this comes greater clarity I believe. Graphic designers know that a great source of inspiration and ideas can be obtained by keeping an on-going scrapbook of great (or really bad) examples of design that they find. Many of you may have such a scrapbook. Well, here is a great young blog featured on Typepad that acts as one big scrapbook for you. As a follow up to yesterday's post on Bill Gates' presentation style, I thought it would be useful to examine briefly the two contrasting visual approaches employed by Gates and Jobs in their presentations while keeping key aesthetic concepts found in Zen in mind. I believe we can use many of the concepts in Zen and Zen aesthetics to help us compare their presentation visuals as well as help us improve our own visuals. My point in comparing Jobs and Gates is not to poke fun but to learn. A key tenet of the Zen aesthetic is kanso or simplicity. In the kanso concept beauty, grace, and visual elegance are achieved by elimination and omission. Says artist designer and architect Dr. Koichi Kawana, "Simplicity means the achievement of maximum effect with minimum means." When you examine your visuals, then, can you say that you are getting the maximum impact with a minimum of graphic elements, for example? When you take a look at Jobs' slides and Gates' slides, how do they compare for kanso? "Simplicity means the achievement of maximum effect with minimum means." The aesthetic concept of naturalness or shizen "prohibits the use of elaborate designs and over refinement" according to Kawana. Restraint, then, is a beautiful thing. Talented jazz musicians, for example, know never to overplay but instead to be forever mindful of the other musicians and find their own space within the music and within the moment they are sharing. Graphic designers show restraint by including only what is necessary to communicate the particular message for the particular audience. Restraint is hard. Complication and elaboration are easy...and are common. "The designer must adhere to the concept of miegakure since Japanese believe that in expressing the whole the interest of the viewer is lost." Take a look at some of the typical visuals used by Steve Jobs and those used by Bill Gates. As you look at them and compare them, try doing so while being mindful of the key concepts behind the traditional Zen aesthetic. Above. Does it get more "Zen" than this? "Visual-Zen Master," Steve Jobs, allows the screen to fade completely empty at appropriate, short moments while he tells his story. In a great jazz performance much of the real power of the music comes from the spaces in between the notes. The silence gives more substance and meaning to the notes. A blank screen from time to time also makes images stronger when they do appear. Also, it takes a confident person to design for the placement of empty slides. This is truly "going naked" visually. For most presenters a crowded slide is a crutch, or at least a security blanket. The thought of allowing the screen to become completely empty is scary. Now all eyes are on you. Above. Gates here explaining the Live strategy. A lot of images and a lot of text. Usually Mr. Gates' slides have titles rather than more effective short declarative statements (this slide has neither). Good graphic design guides the viewer and has a clear hierarchy or order so that she knows where to look first, second, and so on. What is the communication priority of this visual? It must be the circle of clip art, but that does not help me much. Dr. Kawana says that "to reach the essence of things, all non-essential elements must be eliminated." So what is the essence of the point being made with the help of this visual? Are any elements in this slide non-essential? At its core, what is the real point? These are always good questions to ask ourselves, too, when critiquing our own slides. Above. 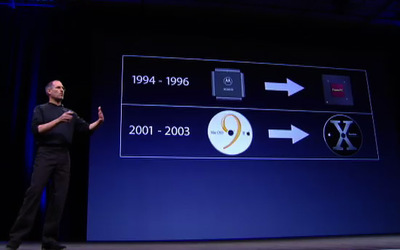 Here Jobs is talking to developers at the WWDC'05 about the transition from the Power PC RISC chips to Intel. Sounds daunting, but as he said (and shows above) Apple has made daunting major shifts successfully before. (He also said sheepishly earlier in the the presentation, that every version of OSX secretly had an Intel version too...so this is not a new thing. The crowd laughed.). A note on having an "open style"
One thing that would help Mr. Gates is an executive presentations coach and a video camera. One unfortunate habit he has is constantly bringing his finger tips together high across his chest while speaking. Often this leads to his hands being locked together somewhere across his chest. This gesture makes him seem uncomfortable and is a gesture reminiscent of The Simpsons' Mr. Burns. 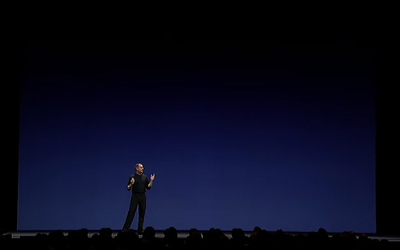 By contrast, Steve Jobs has a more open style and at least seems comfortable and natural with his gestures. Above. 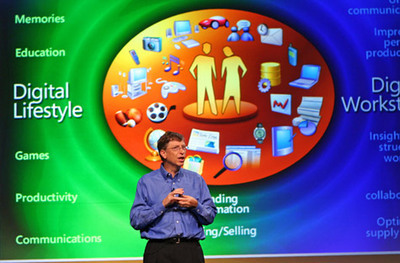 Mr. Gates needs to read Cliff Atkinson's Beyond Bullet Points, ironically published by Microsoft Press. Atkinson says that "...bullet points create obstacles between presenters and audiences." He correctly claims that bullets tend to make our presentations formal and stiff, serve to "dumb down" our points, and lead to audiences being confused...and bored. Rather than running through points on a slide, Atkinson recommends presenters embrace the art of storytelling, and that visuals (slides) be used smoothly and simply to enhance the speaker's points as he tells his story. 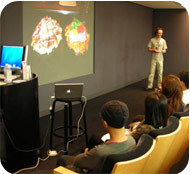 This can be done even in technical presentations, and it can certainly be done in high-tech business presentations. The "Microsoft Method" of presentation? 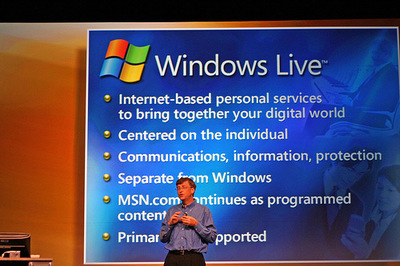 The approach we've seen in Microsoft's last public presentation we can label the "Microsoft Method." This method is not different than the norm, in fact it is a perfect example of what Seth Godin and others call "Really Bad PowerPoint." Here's the rub: A great many professionals see the absurdity of this approach, even a great many professionals on the campus of Microsoft in Redmond. But change will continue to be slow, especially when the executives of the company which produces the most popular slideware program in the world use the program in the most uninspiring, albeit typical way. Above. Chief technology Officer, Ray Ozzie follows the "Microsoft Method" too. (Left) Bullet No.3: "...interfaces through...interfaces"? (Right) Fundamental presentation rule: Do not stick your hands in your pockets. Informality is fine, but this is inappropriate even in the USA (and especially in cultures outside the U.S.). We've talked about many presentation methods here at Presentation Zen, methods that are different than the "normal" or the "expected" but also simple, clear, and effective. Who wants to be "average," "typical," or "normal"? Ridderstrale & Nordstorm say it best in Funky Business: "Normality is the route to nowhere." I'm not suggesting you "present different" for the sake of being different. I am saying that if you move far beyond what is typical and normal in the context of presentation design, you will be more effective and different and memorable. Maybe Microsoft can afford lousy PowerPoint presentations, but you and I can't. For "the rest of us," it all matters. Can we learn from a Japanese garden? Looking for inspiration in different places? Find a book on Japanese gardens (like this one from my friend, designer Markuz Wernli Saito) or visit one in your area (if you are lucky enough to have one). You can learn a bit here about the Zen aesthetic and Japanese gardens in this article by Dr. Kawana. Living here in Japan I have many chances to experience the Zen aesthetic, either while visiting a garden, practicing zazen in a Kyoto temple, or even while having a traditional Japanese meal out with friends. I am convinced that a visual approach which embraces the aesthetic concepts of simplicity and the removal of the nonessential can have practical applications in our professional lives and can lead ultimately to more enlightened design. Back in July, I discussed applying the principles of wabi-sabi to your presentations in Wabi-Sabi and Presentation Visuals (part I) and Wabi-Sabi and Presentation Visuals (part II). In from Wabi-Sabi to Golden Mean I looked a bit more at this ancient "organic" approach to examining visual communication. I was quite interested, then, to read this article, Wabi-Sabi's Simplicity, over at one of my favorite sites, 37signals' Signal vs. Noise. The article has some great links as well. A key tenet behind wabi-sabi, of course, is the idea of simplicity. You can apply the concepts discussed in these articles and posts to presentation design, web design, software development, user interface design, and myriad other creative disciplines as well. So if this "wabi-sabi stuff" is new to you, go make yourself a cup of tea, relax and take some time to explore wabi-sabi's origins, meanings, and applications. "...we all seem to have an innate longing for primitive simplicity, close to the natural state of living." I hope you will be inspired, if only ever so slightly, by this simple idea,... wabi-sabi.